BIRMINGHAM, Ala. – The Southeastern Conference will use a Centralized Video Review process for Conference baseball games beginning with the 2019 SEC season, becoming the first conference to use a centralized process as permitted by NCAA rules. The 2019 SEC baseball television schedule was announced this week. Here is the listing of all regular season and SEC Tournament games. BIRMINGHAM, Ala. – With conference play set to begin this weekend in Southeastern Conference baseball, the SEC will expand the use of official replay review to include six additional plays as allowed by the NCAA and implement a new experimental challenge system for head coaches. Welcome back NCAA Division I College Baseball. It was 234 days since Florida defeated LSU for the 2017 National Championship at the College World Series in Omaha. St. Louis and Old Dominion kicked off the 2018 season in Kissimmee, Fla. Old Dominion’s Jim Fluke delivered the first pitch of the new season. St. Louis CF Matt Schwarz recorded the first hit (first inning single) and scored the first run (wild pitch) of the new year. ODU won the game 8-3. Author batsandblogsbkaPosted on February 17, 2018 Categories Baseball, UncategorizedTags Alabama Baseball, Arkansas Baseball, Auburn Baseball, College World Series, Florida Baseball, Georgia Baseball, LSU Baseball, Miss. State Baseball, Missouri Baseball, NCAA Baseball, Ole Miss Baseball, Omaha, Opening Day, SEC Baseball, SEC Network, South Carolina Baseball, Tennessee Baseball, Texas A&M Baseball, Vanderbilt BaseballLeave a comment on Opening Day! With 13 playing weekends, the 2018 schedule includes one open date for each team and conference contests scheduled each week beginning the second weekend of September. The season begins the weekend of September 1 with 14 games, including five neutral site games on opening weekend. The 2018 season will culminate with the SEC Championship Game in Mercedes-Benz Stadium in Atlanta on Saturday, December 1. It will be the 27th edition of the game and the 25th in the city of Atlanta. 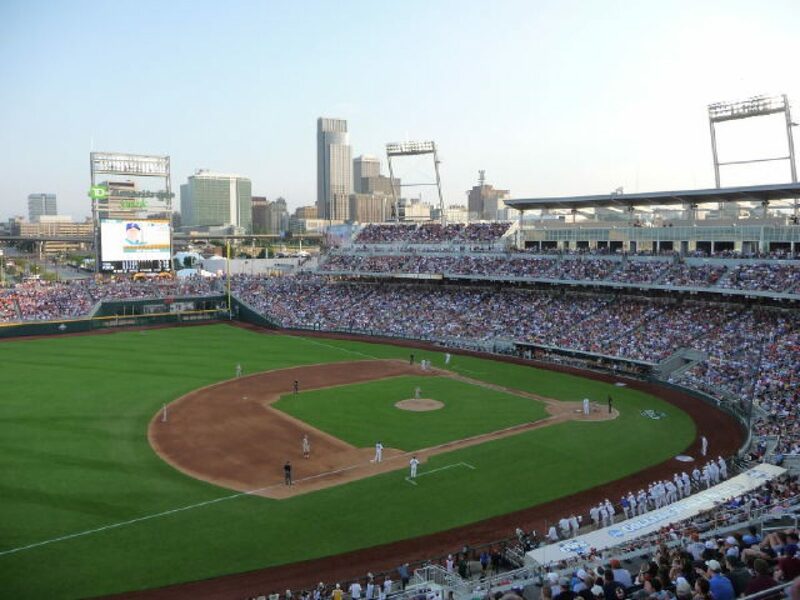 The Southeastern Conference will bring home its 11th College World Series championship this week as 2017 SEC co-champions LSU and Florida meet in a best-of-three series at TD Ameritrade Park to determine the best team in college baseball this season. The series begins tonight at 6 p.m. (CT). The second game of the series will be Tuesday at 7 p.m. (CT). A third game, if necessary will be Wednesday at 7 p.m. (CT). All three games will be televised by ESPN. LSU (52-18) is seeking its seventh CWS championship. The Tigers have won national championships in 1991, 1993, 1996, 1997, 2000 and 2009. LSU’s first five national championships were one game, winner-take-all championship games under legendary coach Skip Bertman. LSU defeated Texas in a best-of-three series in 2009 under head coach Paul Mainieri. LSU has won four of five games at the 2017 CWS to reach the championship series. The Tigers have been outscored 23-21 while in Omaha. LSU opened with a thrilling 5-4 comeback win over Florida in its CWS opener. The Tigers were then bounced into the loser’s bracket after a 13-1 beat down by No. 1 Oregon State last Monday. LSU remained alive with a 7-4 win over Florida State. The Tigers, behind the stellar pitching of Alex Lange and Caleb Gilbert, shut down the mighty OSU Beavers with 3-1 and 6-1 wins to advance to the finals. Florida (50-19) is in the CWS finals for the third time and seeks its first CWS Championship. Florida lost in the best-of-three finals to Texas in 2005 and SEC Eastern Division rival South Carolina in 2011. Florida and LSU both picked up wins on Saturday and in the process earned a share of the 2017 SEC Championship. Florida rallied for a 6-4 win over Kentucky to clinch at least a share of the title. LSU waited out a three-hour and five-minute rain delay and completed a three-game sweep at Miss. State with an 11-7 win. The Tigers will share the league crown with the Gators. LSU has captured a conference-leading 17 SEC Championships after winning its second league title in the last three years. LSU clinched the 2015 SEC Championship at Founders Park in Columbia, S.C. LSU has also won 19 SEC Western Division titles. Florida won its 14 SEC Championship, second only to LSU in league history. The Gators own an SEC-best 23 SEC Eastern Division titles.